Carpet Ten Green - Recyclable! Carpet Ten Green is a plush trade show carpet that is easy to assemble and easy on the environment. Its available in multiple colors so it can match any booth design. We offer nearly any size of configuration available so its easy to customize flooring for events and halls with non-traditional layouts. Most colors are in stock and ready to ship within a few days. 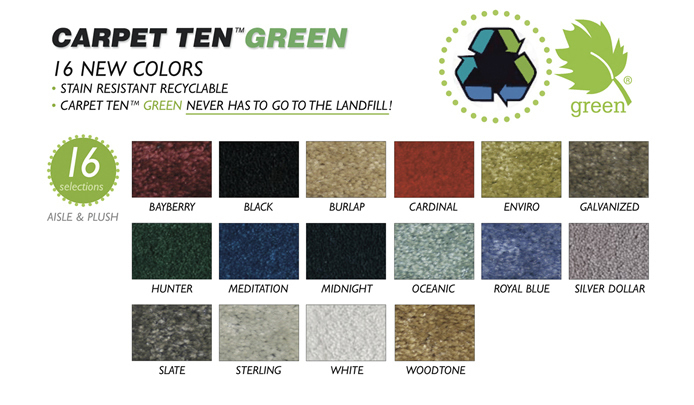 The materials used to create Carpet Ten Green are recyclable making it easy and safe to dispose of the carpet. There are two unique packages we offer for Carpet Ten Green. Its available as a kit with carpet, padding, and ground shipping or a complete kit that also includes carpet bags. We offer a large selection of standard sizes with the ability to create custom sizes as requested. We also offer rollable bamboo flooring which is a great eco-friendly hardwood alternative to portable carpet!